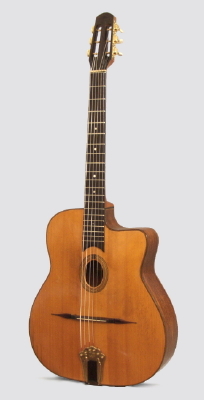 J. Castelluccia Selmer/Maccaferri Petit Bouche Style Model Gypsy Jazz Guitar (1996), made in Paris, natural finish, figured Indian rosewood back and sides, spruce top; mahogany/rosewood laminate neck with ebony fingerboard. A very fine modern French Selmer-style guitar by well-regarded Paris luthier Jacques Castellucia. Highest-grade materials throughout, a beautiful and very authentic re-creation of the iconic "Django" style guitar. Overall length is 40 in. (101.6 cm. ), 15 3/4 in. (40 cm.) wide at lower bout, and 4 1/8 in. (10.5 cm.) in depth at side, taken at the end block. Scale length is 25 1/2 in. (648 mm.). Width of nut is 1 7/8 in. (48 mm.). Overall clean with some moderately heavy playwear to the top (touched up in places) and several repaired cracks to the top in the lower bass bout area. Plays perfectly with a very good sound; an excellent Selmer reproduction. Generally Excellent Condition.